Taxi drivers or operators who will refuse to reduce their flagdown rate by P10 starting today, as ordered by the Land Transportation Franchising and Regulatory Board (LTFRB), will face stiff penalties. Battered husbands can secure a Barangay Protection Order from the barangay captain to prevent their spouses from staying at their conjugal homes and avoid another incident of domestic abuse. This school year’s graduates of Cebu City public schools are spared from paying fees, after the City Government decided to subsidize the P150 that each student was supposed to pay this month. Under the Joint Administrative Order No. 2014-001, taxi drivers and operators refusing to follow the new LTFRB en banc order of P30 flag down rate starting today will be fined P5,000 each for the first offense. A fine of 10,000 will be imposed for the second offense. The taxi unit will also be impounded for 30 days. On the third offense, the driver and operator will be fined P15,000 each and the Certificate of Public Conveyance or franchise for the taxi will be revoked. According to LTFRB, passengers can file complaints of noncompliance. Once filed, both the driver and operator will be summoned. 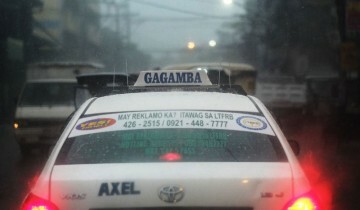 If the evidence is sufficient, LTFRB can impose penalties immediately. LTFRB also informed the public that the P40 flag down rate will still reflect in the taxi meter until it is re-clibrated but the drivers should already deduct P10 from the total fare. This does not include yet the 20-percent discount for senior citizens, students and Persons with Disabilities. A battered husband can proceed to the barangay hall and ask for a Barangay Protection Order, which will disallow the wife of the complainant from entering their conjugal house to prevent more incidents of domestic abuse. This is covered by the domestic violence ordinance authored by Cebu City Councilor Gerardo Carillo, which also gives equal protection to husbands who are being maltreated by their wives. The ordinance was crafted a few years after the enactment of Republic Act 9262, or the Anti-Violence Against Women and Their Children Act, in 2004, which only covers the rights of women and children. Jurevel Simeni, 18, of Iligan City, and Vivencio Rocamora, 20, of Barangay Luz, Cebu City are jailed for allegedly insulting and cursing policemen who confronted them following a complaint by tourists whom they kept on following. They are believed to be “gays” looking for customers. During the confrontation, Simeni allegedly shouted at the police, said “buang ang mga pulis sa Cebu City,” and spat on the faces of PO1 Berlino Ricafort and PO1 Ariel Nuñeza. Simeni resisted arrest while Rocamora tried to pull him away from the policemen. The former fractured his shoulder during the struggle, prompting the police officers to immediately bring him to Cebu City Medical Center for medical attention. The Cebu City Government decided to disburse P3.7 million as subsidy for the P150 graduation fee each of the students were supposed to pay this month. Some 26,050 elementary and high school students are expected to graduate in Cebu City public schools. The subsidy is covered by the newly approved City Ordinance 2412 (Ordinance Providing for Graduation Fees Subsidy to all Public Elementary and secondary Schools in the City of Cebu) that City Councilor Alvin Dizon authored.